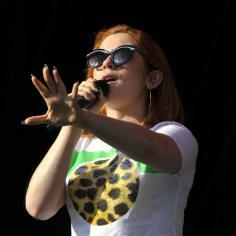 Katy B believes the music industry has forced her to be stronger. The 24-year-old singer admits dealing with success at such a young age can be tricky for anyone but she insists she's developed a thicker skin from dealing with the pressures of fame. She said: ''I'm not sure if it's harder being a women or being young when you get successful but I brush things off more than I would before. ''It's quite stressful going on tour for months on end and being away from my family and friends but I've learned to deal with it. ''I've thought about bringing friends out with me but this is my job and I have to really focus and not talk to anyone sometimes for an hour before a show and rest my voice. However, the 'What Love is Made Of' hitmaker admits there are some negatives to fame because she attracts unwanted attention when she's on a night out. She explained to The Sun newspaper: ''I go out to listen to the music. I'm a real DJ trainspotter. Like, 'What's this track? I need to know it'.